Every top athlete will tell you success in sports is more than endless hours of training. There is a certain percentage of luck and divine intervention. This divine intervention is clearly spelled out for us in the Bible. While there are scores of verses which speak directly to this, here are my Top 10 bible verses for athletes. 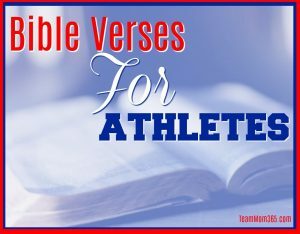 These bible verses encourage athletes to perform their best… and more importantly, be the best representative of their sport and themselves. Did you notice when reading this verse that it doesn’t say you must win or you will win? It is actually telling us the kind of effort and dedication victory requires. Competing with integrity is the key here. Anyone can cheat and win but what does that do us morally. It’s not about winning at all costs or abandoning your values to do anything it takes to win. This is telling us we need to perform at our absolute best and have the self-discipline to compete in a focused, well-practiced and strategic manner. If we do that, we will have performed in such a way that we will be nearly impossible to beat. Will we get beat sometimes? ABSOLUTELY! However, in performing with honor we can feel victorious even in a loss. Athletes are incredibly self-aware folks. We internalize a great deal of our journey as an athlete. All losses are our fault while all victories belong to the team. We may even want to give up at times because we feel inadequate. This verse tells us to not depend on our own understanding as we are hardest on ourselves. We need to lean on God to show us which path to take. There will be times… many times… when our path isn’t clear. It’s these times we need to feel His ever-present power in every decision, move and action. Talent is abounding in the sports world, but talented athletes are a dime a dozen. However, those who call on more than their talent and seek the divine power of God will have the edge in every contest. No matter the sport you play, endurance is required to win. We are not just talking about the endurance to win a marathon or long cross country skiing event, endurance is also the ability to withstand long practices and long seasons. Take, for example, the travel volleyball season which typically starts in November and doesn’t end until mid-June. Endurance is required to maintain good health and stay positive throughout. Many times during the season we need to summons God’s strength to persevere. He gives strength to the weary and increases the power of the weak. Even the youths grow tired and weary, and young men stumble and fall; but those who hope in the Lord will renew their strength. They will soar on the wings like eagles; they will run and not grow weary; they will walk and not be faint. There are points in every athlete’s sports career when we grow weary. We feel like our talent is not enough, our strength is fading, when we feel like we are trying our hardest but the hits, baskets or goals just aren’t coming. It’s these hard times when we have to dig deep and turn to the Lord to see us through the doldrums, slumps and tough times. Do not conform to the pattern of this world but be transformed by the renewing of your mind. Then you will be able to test and approve what God’s will is – his good, pleasing and perfect will. I know it’s a cop out to have a tie but both of these verses are saying essentially the same thing. We need to trust God’s will… His perfect will. Have you ever prayed for something incredibly hard and it’s didn’t come true? Guess what, that’s because God had a different plan for you. Only God knows the plans he has for us. It’s up to us to trust his plan and live it to our fullest. If you think about it, that’s kind of refreshing. If we truly give our lives to God and live His plan, we will live more contented lives. The words of the reckless pierce like swords but the tongue of the wise brings healing. Yup, another tie. I always find it interesting that when God wants us to know something he not only uses gentle persuasion; he also employs a sledge hammer when necessary. There are several places in the bible where were are told to be mindful of what we are saying. These two verses perfectly convey the opposite outcomes of the words we speak. The first is saying by speaking rashly we will cause ruin while the second takes it a step further and says speaking kindly (or wisely) you can bring healing. How easy it that? It has never made sense to me to trash talk your opponent. Quite the contrary, after a hard fought match or even a blow-out, you should lift your opponent up in praise. They battled – no matter the score. They deserve credit for their effort. By being the bigger person you might even bring healing to their loss and those who hear you will think better of you. We all know those athletes (especially the professional athletes who have a nationwide platform), who can’t seem to help themselves from trash-talking. They need to rise above, act with honor to themselves and their sport, ‘guard their lips’ and take great care of the platform they have been given. I pray that out of his glorious riches, He may strengthen you with power through His spirit in your inner being. Not only are athletes required to be physically tough, they must be mentally tough as well. We need to call for God’s blessing to strengthen not just our physical performance but to also give us the mental toughness and acuity we need to outwit and out strategize our opponent. You have been given an incredible gift. God has looked down upon you and blessed you will some type of athletic prowess. Whether it be the ability to pitch a 100 mile per hour fastball, run like lightening, swim like a fish or jump out of the gym, no matter what is it, this power came from above. Yes, you practice… a lot… and very hard… but you are only enhancing what you have been given. Be whole-heartedly thankful for His gift. This is without question my favorite Bible verse for athletes. This verse has seen me through so many of the trials and tribulations in my sports career… and in life. It lifted me when I needed courage and pushed me forward when I needed strength. And simply knowing that God is with me wherever I go has a very calming effect on my performance. Here are some other great verses to lean on in time of athletic prosperity as well as adversity. For by you, I can run against a troop and by my God I can leap over a wall. For He will command his angels concerning you to guard you in all ways. 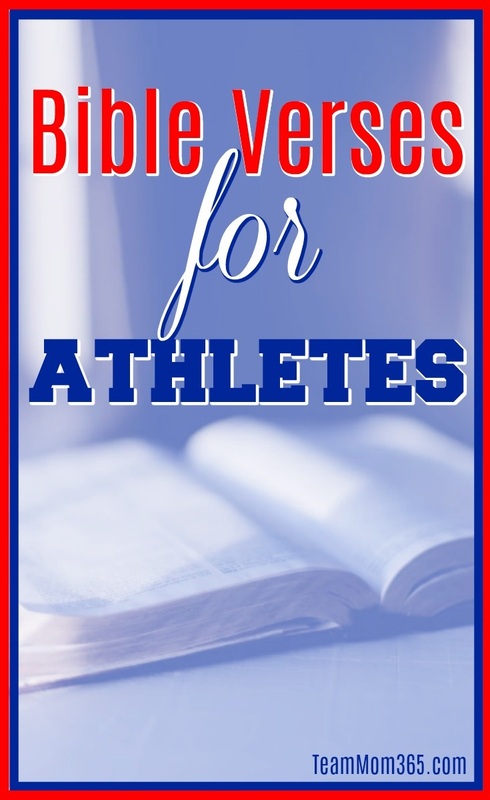 What is your favorite bible verse for athletes? If you have a favorite comment below. I’d love to hear them!